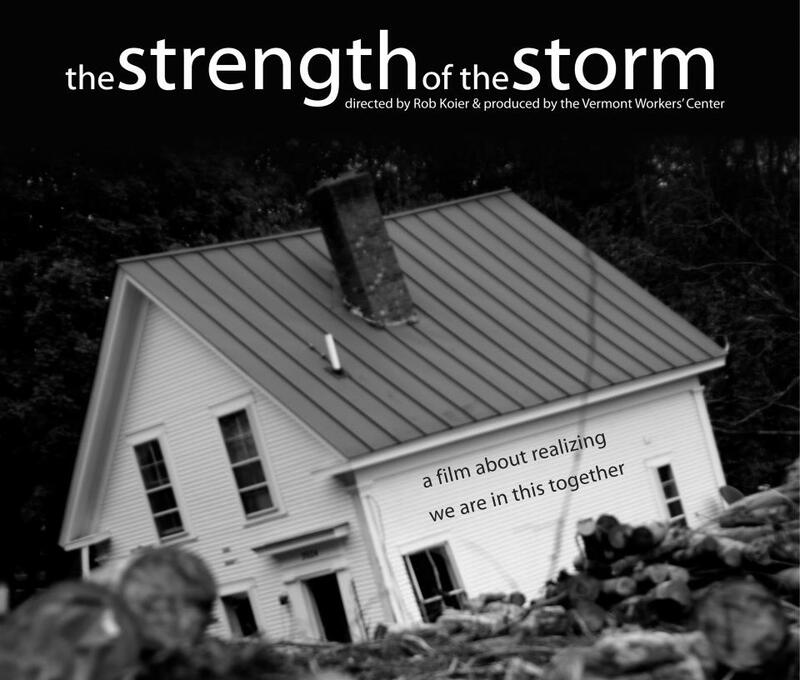 “Strength of the Storm,” a new film by Vermont filmmaker Rob Koier, tells the story of a group of mobile home residents who, after losing their homes to flooding in the wake of Tropical Storm Irene, discovered both the power and transformative nature of grassroots organizing. The film shows the human costs of the storm, the injustices faced by the most vulnerable Vermonters during its aftermath, and mobile home residents’ struggles to make their voices heard. Subtitled “A film about realizing that we are in this together,” it weaves together stories of economic inequality, climate disruption, personal transformation and collective action into an inspiring vision of the people most affected by injustice building social movements to demand their human rights. At the end of August 2011, the eastern US braced for the arrival of Hurricane Irene. In most places, the damage directly from the storm was less than expected, and Irene had in fact been downgraded from a hurricane to a tropical storm by the time it hit Vermont. Nonetheless, the sudden dumping of huge amounts of water into narrow mountain valleys created widespread and devastating flooding throughout the state, washing out roads, damaging or destroying homes, and destroying or rendering unsalable many farmers’ crops. Hardest hit, however, were residents of mobile home parks, many of which are built in flood plains where regulations prohibit the development of permanent housing. Mobile homes are one of the few affordable housing options in Vermont, the most rural state in the country, and most residents survive on part-time or temporary work, Social Security and/or disability. After the storm many found themselves not only without a home, but with a huge liability: having to pay thousands of dollars for the destruction and removal of their now uninhabitable mobile homes. Like most Vermonters, members of the Vermont Workers’ Center, a grassroots workers-rights and economic-justice organization, had thrown themselves into the relief effort after Irene. When VWC members doing volunteer relief work at the Weston Mobile Home Park began to hear some of the residents’ stories, and their frustration with local government, they offered assistance in organizing. The VWC, having won the country’s first universal healthcare legislation in May using a human rights framework, had recently launched “Put People First,” a campaign to demand that the government meet all of its human rights obligations – including the human rights to safe housing and dignified work. The mobile home residents built their own organization, Mobile Home Residents for Fairness and Equality, reached out to mobile home residents throughout the state, went to their local selectboard, circulated petitions and held press conferences and forums. Within two months, they had won a significant victory — the state announced that it would remove damaged homes from the parks at no cost to the former residents. The story could easily have stopped there, but having tasted the power and dignity that come from organizing, the mobile home residents decided to join broader efforts to win dignity, respect and justice for working-class and low-income poople. The film shows mobile home residents confronting the social assumptions that people who live in mobile homes are “trailer trash,” and lets them tell their stories of personal transformation, from individuals who are resigned to injustice to a community that is hungry for justice. This film is important in the current political moment, when the world is in the midst of interrelated economic and environmental crises, and when the political allegiance of lots of people — including rural working-class whites — is up for grabs. It shows how organizing with a bold, clear vision that appeals to people’s values — especially the values of communities taking care of each other — can win concrete gains, transform individuals, and contribute towards building the kind of broad progressive movement that we need in order to transform our country and our world.